7.30 Check-in at the River City Shopping Complex, Si Phraya. 8.00 Depart by coach from the River City Shopping Complex. 9.30 Arrive at the Bang Pa-In Summer Palace, built during the Ayutthaya era. The palace is beautifully decorated in both traditional Chinese and European style. Arrive at Ayutthaya, the Ancient City, which was the former Thai capital for over 400 years. Nowadays the glory and the beauty of the grand palace and temples of its past has vanished, leaving merely a glimpse of ruins, despite this it is a good reflection of the past. River Sun brings you a combination of both the ruins and the remaining historical attractions. - Wat Maha That: Over 600 years old, Wat Maha That was the heart and soul of the Ayutthaya people. It was almost completely destroyed by the Burmese during Thai-Burmese war. 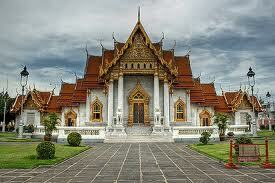 -Wat Na Phra Mane: Remains in perfect condition, as it was used as the Burmese headquarters. The splendid Golden Buddha, dressed in regal attire, was placed in the temple along with the three thousand-year-old green stone carved Buddha. Both are considered as extremely valuable national relics. - Wat Lokayasutharam: has a mysterious past, whereby its origins are unknown. The temple enshrines a Largest Reclining Buddha Image which was built during The Early Period of the Ayutthaya Region. The other two ancient temples, as well as the ruined site also surround the compound area. 12.30 Depart Wat Lokayasutharam for the River Sun Cruise, at Wat Chong Lom Pier, Nonthaburi. Buffet Lunch: “Delicious Meals served in the luxurious surroundings of the cruise boat”. - Arriving at the city, Pass the Royal Grand Palace, Pass by Wat Arun (The Temple of Dawn). The temple was the former palace when the Thai capital of Ayutthaya was replaced by Thonburi. 16.30 (approx) Arrive at the River City Complex Pier, Si Phraya. Throughout the cruise, the Chao Phraya River scenery can be enjoyed from the comfort of the passenger rooms or the refreshing open air upper deck.